This design project was finished a couple of weeks ago, but I didn't have time to write a blog post about it. I still don't have much time -- the last two months turned out exceptionally busy for me -- so I'll be as brief as possible. 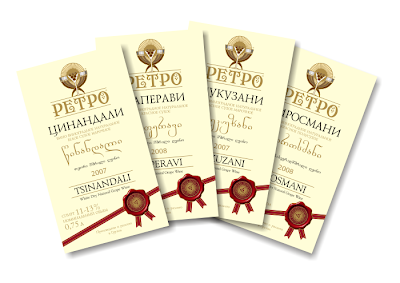 Since the Russian embargo on Georgian wines, imposed in 2006, our winemakers have been actively trying to enter different markets, but so far they have been able to establish their tangible presence only in Ukraine. 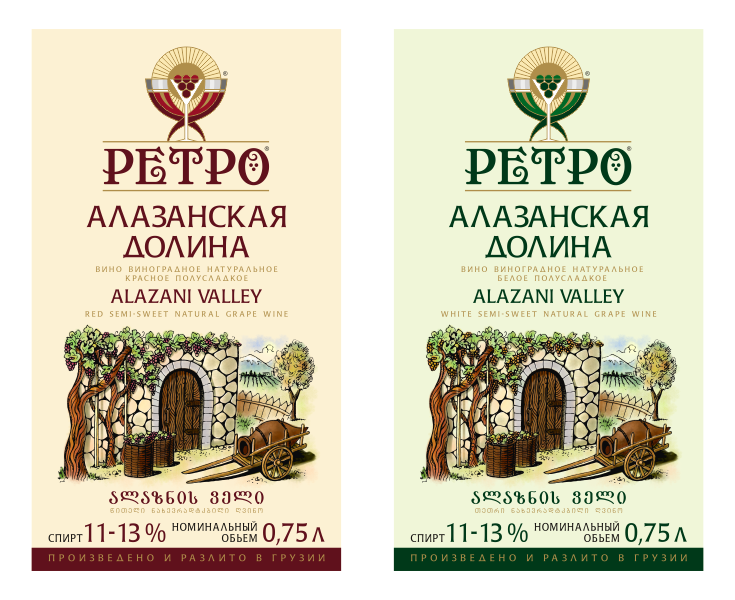 Recently that started to change, as Georgian wine companies have begun making more notable advancements in Belorussian market, too. 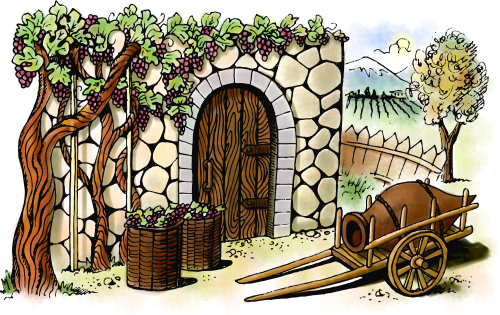 On that wave, I was contacted by an old customer of mine, who had been away from wine business since the Russian ban. Now he was back in full glory, with a new company and a brand new project aimed exclusively at Belorussian export. The first thing was to create a trademark which needed to be registered locally. "Retro" was chosen as the brand name, and I was instructed to visualize it by keeping to the beaten track, avoiding any risky experiments. The design had to be approved by both parties -- the Georgian manufacturer and the Belorussian distributor. I offered them several trademark designs and logo font variations, and after some cogitation they decided on the version you can see below. The trademark design is based on traditional Georgian wine-drinking horns, and the logo is based on a heavily modified free font called Apollo ASM (a small amount of money has been donated to the author). By the way, the font doesn't support Cyrillic, but, fortunately, the word RETRO in Russian can be typed with standard Latin letters -- PETPO. And below are the labels featuring that artwork. You might notice that I have changed the color of the grapes for the white wine label. 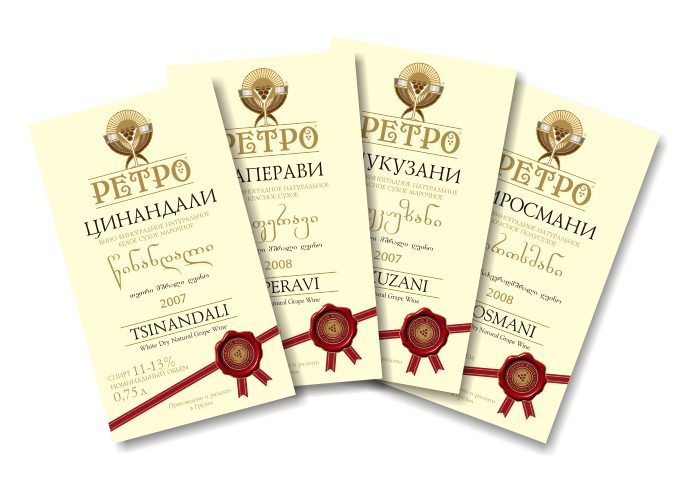 The leading inscriptions on the labels (and all the information on back labels) are in Russian, not in the native Belorussian (although similar, they are still different languages), which is rather strange, given the strict requirements the manufacturers have to meet when designing their products for the local market. See that huge size of the alcohol percentage and the volume? Long live the Belorussian bureaucracy, which surpassed even the Russian one! 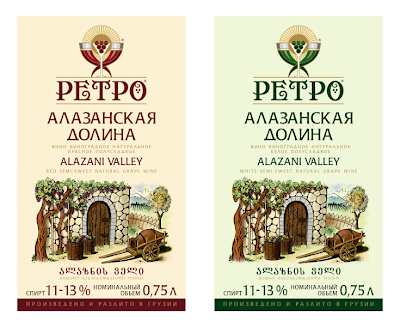 The third series consisted of red semi-sweet wines (namely Akhasheni and Kindzmarauli) and had to be based on an existing design. Since the labels were derived (legitimately, of course) from another artist's work, I don't feel comfortable with posting those samples here. Okay, folks, I honestly tried to be brief here, but I got carried away, as always. I really need to learn how to write short blog posts. Any training courses on that?